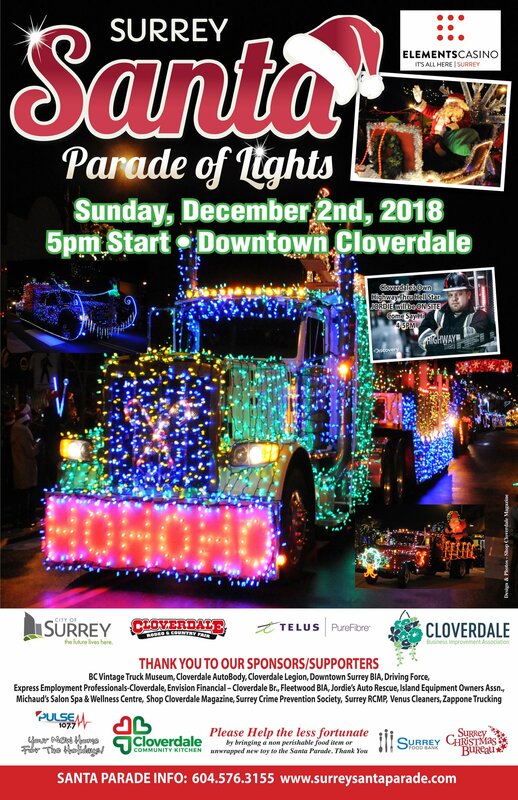 Surrey/Cloverdale – The 2018 Surrey Santa Parade of Lights rolls through Downtown Cloverdale at 5PM, Sunday December 2. The 13th Annual Surrey Santa Parade of Lights is organized by the Cloverdale BIA, with the help of local businesses, non-profit organizations, clubs, and many volunteers who believe in the magic of Santa. Website info can be found here including the parade route. Be the first to comment on "2018 Surrey Santa Parade of Lights Rolls Through Downtown Cloverdale – Sunday December 2"